I just LOVE strawberry season!! 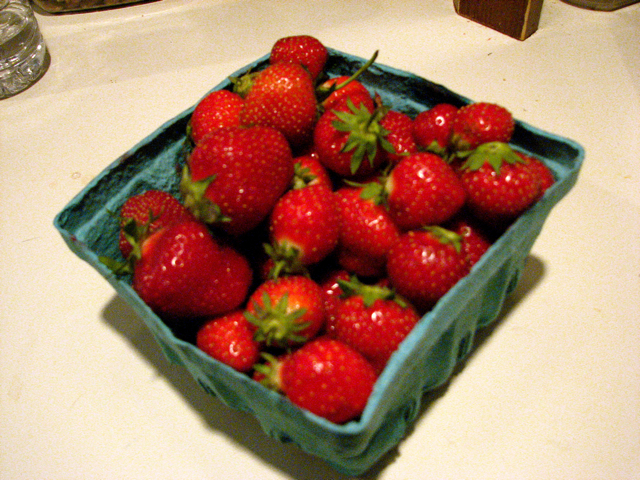 Fresh strawberries are in abundance where I live in farm country! So every year I make lots of strawberry jam…….unfortunately I did not have a lot of time to make my usual 12-15 pints of jam. 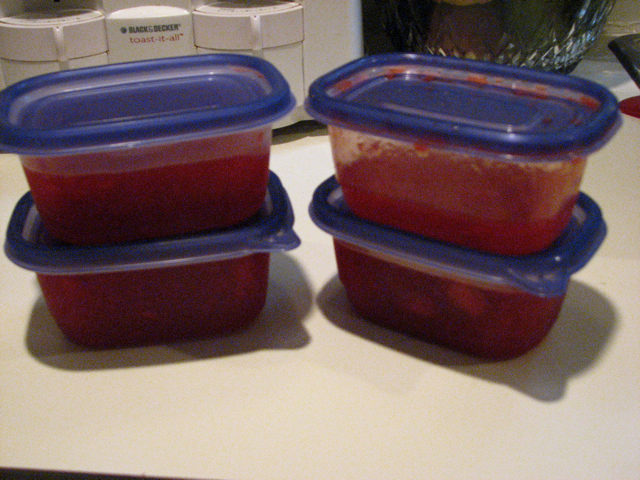 So I bought ONE quart of strawberries and made 4 pints of jam…….it took about 30 min. from start to finish! Have you made freezer jam before? If not let me show you HOW simple it is! Wash, cut off the stem and mash. Add 4 cups of sugar (yep 4 cups!!) – Let the berries and sugar sit for 10 min. Pour the sure jell mixture into strawberry mixture, stir well and there you have it Homemade Strawberry Jam!! In case you are wondering why the jam upper right side container is almost empty….well what do you expect I made the jam 2 days ago!! And it is SO delicious!! It makes great PB and J sandwiches, great on toast and biscuits in the morning……and my all time fav, it makes a wonderful topping for vanilla ice cream! I am off to enjoy some on ice cream right now. Mmmmmmmmmmmmmmm! I think I am going to make some tomorrow! We picked about 10 pounds the other day! We are also going to make strawberry malts ! Looks good. believe it or not I don’t care for the taste of strawberries…I am convinced it’s because I was allergic to them as a child (am no longer allergic!). My hubby and daughters LOVE them. I wonder if I could make raspberry jam this way?? i LOVE raspberries, blackberries and blueberries…and JAM! 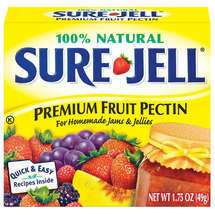 I am the only one in the house who eats jam or jellies…this process looks easy! i was always under the impression that you needed all those mason jars, etc. How long does the jam keep in the freezer? Oooh…that sounds easy & yummy! I might could even do it. Thanks for sharing! And thank you for coming by to visit me today. I’ve been very busy & haven’t had much time for blogging. It’s nice to know others still read. I’ve never made freezer jam. Looks GREAT, though! We’re staying at Lake In Wood. 🙂 On our way home from a long beach day right now, and will probably need a sleep-in day tomorrow. Or else it would have been fun to meet you for breakfast! We are here until Sunday doing the visiting-family-and-friends thing. I love making jam during the summer too, with different kind of fruits..but strawberry always come out on top!